Scientists have known for some time that Phobos, the larger of Mars' two small moons, is a victim of gravity, edging closer toward its parent planet. But new research shows Phobos already is starting to fall apart. Long shallow grooves cut into the moon's surface appear to be stress fractures, according to a study presented at the American Astronomical Society's planetary sciences meeting in Maryland this week. Previously, scientists thought the grooves were fractures from an asteroid impact that nearly shattered the moon. The impact left a lasting impression in the form of the Stickney crater, a six-mile wide basin that is nearly half the width of Phobos itself. Later analysis showed the cracks are not stemming outward from the crater, but radiate from another point nearby. 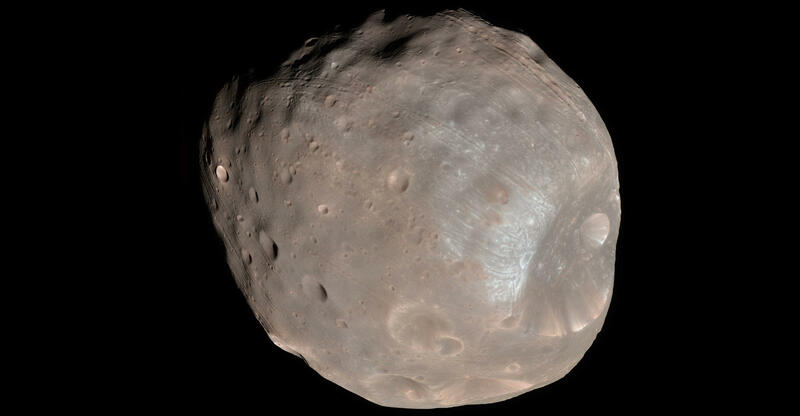 That led to a new theory that the grooves are produced by small pieces of debris flying off Mars and smashing into Phobos, which orbits as close as just 5,800 miles above the Martian surface, closer than any other known moon circles its parent planet. Terry Hurford, a planetary scientist with NASA's Goddard Space Flight Center in Maryland, and colleagues have another idea. New computer models show that the grooves are aligned like stretch marks, telltale evidence of tidal forces in the ongoing gravitational tug of war between Phobos and Mars. Phobos is losing the battle, inching closer to Mars at a rate of three- to six feet per century, Hurford told Discovery News. That gives the moon between 30 million and 50 million years before impact, but scientists doubt it'll get that far. "We think the grooves are signs that this body is starting to break apart tidally and that these are the first evidence of the tidal deformations of Phobos," Hurford said. "Eventually, Phobos will be ripped apart before it reaches Mars' surface." The new computer model also predicts that the interior of Phobos is weaker than its exterior covering, which is mildly cohesive and somewhat elastic, added Arizona State University planetary scientist Erik Asphaug. Scientists have many questions about Phobos, and its sister moon Deimos, both of which may be captured asteroids. NASA and other agencies are looking at missions to Phobos as a steppingstone to human missions to Mars. "I think it's an exciting location," Hurford said.